• Perfect wherever you’d like to charge smartphones and other devices, such as next to the nightstand or along kitchen counters. • The adorne USB Outlet lets you plug directly into the wall and skip searching for clunky cable connectors. • At 2.1A, this USB outlet offers enough power to quickly charge even large devices. • The Half-Size USB Outlet contains only one USB charging outlet. 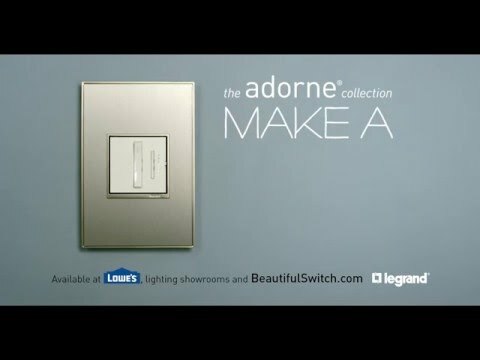 Pair with other devices such as adorne Switches and Dimmers for more functionality in a single wall plate. • For two USB charging outlets in a single wall plate, simply order two Half-Size USB Outlets. Rated 5 out of 5 by Phil28 from Well made component Installed on a kitchen remodel, looks great and works the same. Love the "snap in place" to mount the the hidden wall subplate. Rated 5 out of 5 by mk68 from Great option This is the fourth half size USB outlet we will have. They are great add ons to existing Legrand outlets (like I’m doing) or a great way to keep your highly visible outlets from getting cluttered. This USB outlet will be dedicated to Alexa. Rated 1 out of 5 by egary from Jury is still out I am waiting to install this item until the Brushed Pewter wall plates are available. It is unclear when these will be in stock again. I have recently purchased 2 of these devices and paired with non-GFCI outlets. Both emit a high pitched whine. Is there anything I can do about this? You can plug a very small flash drive into it while not in use. This is the only solution we have found. My husband and I have two of these on each side of our bed and they only emit the high pitched noise while not actively in use. Wish they would find a fix for this! I wanted to use the USB outlets on the kitchen countertop and they trip the GFCI protected line. Is there a way to connect these USB outlets to a CFCI protected line? Can this gang with a 20A GFCI in the single plus sized wall plate? Thank you for your question. Unfortunately, it won't fit with any GFCI in a plus size wall plate. This is because the backbody of the GFCI will take up the entire opening in one of our mounting brackets. I've attached a page from our catalog showing the size of the backbodies for our devices. Anything that says &quot;Plus-Size&quot; in the Backbody Size column can't be paired with anything else. Hope this helps! Is there a smaller face plate for the Half-Size USB Outlet? Looking to install this outlet as a single source of power for a wall-mounted iPad. Thank you! No, there is not. &nbsp;A few solutions though. &nbsp;Put in a half size switch for something next to it or a half size night light. &nbsp;You can also put in a blank (they have these at most Lowe&rsquo;s). &nbsp;A better option and what I did is do a large plate, so a standard 15/20amp and add in a usb. What dimmer switch can I pair with a single half size USB outlet? Thank you for your question regarding Legrand adorne USB outlet(model # ARUSBM4). The USB outlet and be used with adorne switches(Paddle, Push, &amp; Whisper) and any non-GFCI adorne outlets. &quot;...The USB outlets should not be causing the GFCI to trip as long as your are not sharing a Neutral connection...&quot; Per your response these USB can't be used on a kitchen countertop unless a dedicated circuit is added, Is this correct?